More than 20 heads of state and government Thursday joined Kenyans in celebrating 50 years of independence at Kasarani Sports Centre, Nairobi. Leaders from across the political divide in the country also came together, as a sign of unity, to reflect on the successes and challenges of the last 50 years as Kenyans. 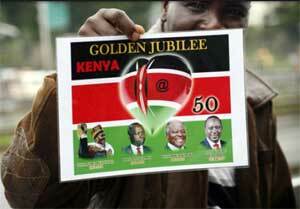 The golden jubilee commemorated in the 47 counties, was marked by a 21-gun salute. Kenyans were treated to a diversity of cultural entertainments from across the country and the EAC region. The climax of the celebrations was the President’s speech read in all administrative units in the country. Six heads of state and government, who spoke on behalf of all visiting delegations from across the world, expressed solidarity with Kenya and its leadership as the country marked the 50th birthday. Visiting presidents who spoke were Jakaya Kikwete of Tanzania, Yoweri Museveni of Uganda, Dr Joyce Banda of Malawi, Goodwill Jonathan of Nigeria, Ali Bongo of Gabon and Ethiopian Premier Hailemariam Desalegn. Also in attendance were immediate retired President Mwai Kibaki, former Prime Minister Raila Odinga and former vice president Kalonzo Musyoka. President Kikwete assured that Tanzania would continue to strengthen the existing cordial relations with Kenya and the East African Community for the benefit of people in the region. President Jonathan of Nigeria urged Kenyans to remain united in order to build an all-inclusive society ready to shape the country’s destiny as one people. Deputy President William Ruto affirmed the Government’s commitment to work with all Kenyans including the media to create a nation at peace with itself. “I thank God for taking the country this far. As we celebrate the golden jubilee of independence, let us also honour the freedom fighters and our fore fathers who laid firm foundations of a united Kenya,” Mr Ruto said. Other President who attended the celebrations were Joseph Kabila of Congo, Seretse Khama of Botswana, Isaias Afwerki of Eritrea, Pierre Nkurunziza of Burundi, Mahinda Rajapaksa of Sri Lanka, Ikililou Dhoinine of Comoros, Mohamed Abdulaziz of Saharawi Arab republic and Salva Kiir of South Sudan.